immune serum was not administered. I ,, i ... ,..1 Ieport 4 . An Outhrl cute Gastroenteri i '..''. alert, but had flaccid paralysis of both lower extremities. endotracheal washings are in progress. County health authorities; in 1967, 34; and in 1968, 11.
before the slop in Hong Kong, and breakfast after the stop. ported, hut fever. chills, and bloody diarrhea were not. examination revealed no gross lesions within the stomach. asymplomatic within 12 hours after the onset of symptoms. because of the small number of cases. based on surveillance reports to Special Pathogens Section. NCDC. Series P-25. No. 369; 1967, Series P-25. No. 30.
nonwhites or 10 times the rate for whites (0.57 antd .06.
respectively); 54 percent of all ca-.c- xere in female-. were uniformly higher for nontwihites than for w whites. inadequate or no immunization wire, comparable (Table 3). tient- with intermediu- and indeterminate type organisms. of isolnae- in the Norlh and the southh (63 and 76 percent. -train- \\ ere to ilenic t\\ ib no ni ficant \ earl\ differences. _____ "_ -_ '* _. ,i .
Kno'n Urknoin Number of Ca-e Fatalh Ratio"
Gra 9 12 I 1. N oIf i, I Or r fr M h: h ! terium tuberculosis many years ago. element in modern tuberculosis control programs. persons identified as haring tuberculous infection. 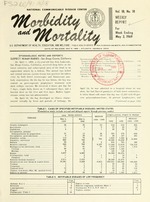 tuberculosis, in which active disease has been excluded. tious case has ended and tuberculin tests remain negative. household with an active case. ment should be started in the last trimestrr. bacterium tuberculosis. No confirmation test necessary. another mycobacterial PPD, if available. gestive clinical evidence of tuberculosis. entire epidemiologic year (Figure 2). Connecticut also recorded increases for these 2 years. COMPARED WITH 1964-65 THROUGH 1967-68. *Includes visions through April 19, 1969. CHIEF, EPIDEMIOLOGY PROGRAM A. D. LANGMUIR. M.D. EDITOR MICHAEL B. GREGG, M.D.